Quick Ship Items Ship UPS Next Day Air. 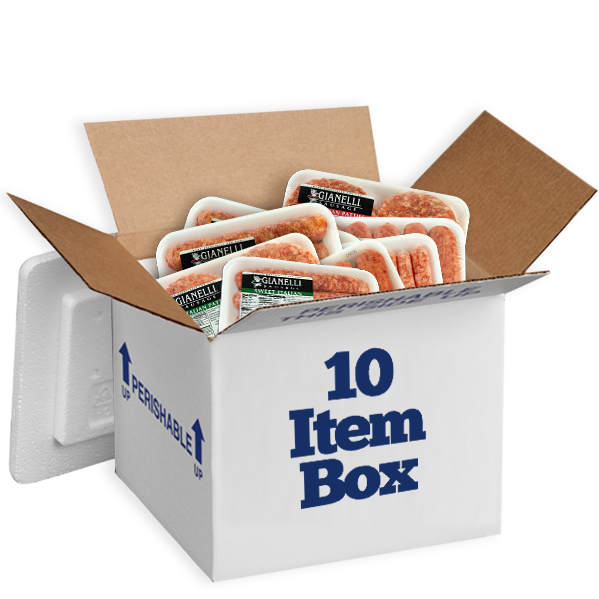 Our 10 item box allows you to mix and match from the following 7 Gianelli Sausage items: Hot Italian Pork Links, Sweet Italian Pork Links, Hot Italian Pork Patties, Sweet Italian Pork Patties, Hot Italian Turkey Links, Mild Italian Turkey Links and Pork Breakfast Links. Mix and match any combination to total 10 items and we’ll ship them off to you. To add an item to your 10 ITEM BOX, click on its image on the right to add it to the box on the left. If you wish to remove an item, click on its image on the left to remove. Once you’ve selected the 10 items in your box, click the ADD TO CART button to add the box to your shopping cart.